Everyone is familiar with the old concept of structural teeth correction. It used to be everything from heavy metal brackets and wires, to treatment plans that included full headgear for night wear. It is no wonder teenagers avoided having braces, and adults often choose to live with structural problems of their teeth, rather than endure going about their daily business with such obvious dental appliances. Those days are no more. For an increasing number of orthodontic patients, the Invisalign treatment plan is a viable option that eliminates many of the challenges associated with conventional braces. Unlike conventional braces, Invisalign is made from durable, moldable plastic, as opposed to sharp, uncomfortable metal. Each set is custom made for the patient and serves the same purpose as the metal brackets and wires in that it gradually reshapes the position of the teeth to provide a perfect smile. 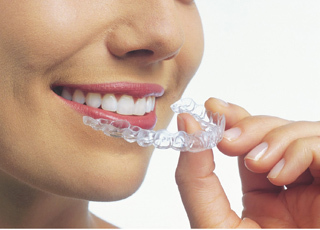 There are several advantages to choosing Invisalign over conventional orthodontic braces. The first is appearance. There is nothing to be ashamed of when wearing traditional braces, but the fact remains many people are uncomfortable with their appearance. Since Invisalign devices are made from a virtually clear plastic material, this type of dental correction unit is more discreet than metal braces. That doesn’t mean it is impossible to see, but most patients are pleased with its almost non-existent appearance. Adults, especially, find Invisalign to be a good alternative because it allows them to continue in their careers and other social engagements without awkward questions. One of the biggest drawbacks to conventional braces is practicing good dental hygiene. The brackets and wires of braces make it incredibly difficult to brush and floss the teeth. With Invisalign, the patient only has to remove the device, much like a mouth guard, and brush and floss as usual. This convenience promotes good hygiene throughout the entire treatment process. Another advantage of the Invisalign system is it eliminates the necessity of avoiding certain foods. Just as with hygiene practices, the device can be removed for the patient to enjoy popcorn at the movies, or a nice crunchy apple, and everything from chewing gum and caramels, to having a few chips while watching TV. To learn if Invisalign is for you, contact Dr. Mechael and her knowledgeable staff for more information.